President Recep Tayyip Erdoğan addresses a meeting of provincial election officials at the headquarters of the AK Party in Ankara, Jan. 29, 2019. President Recep Tayyip Erdoğan said Tuesday the March 31 local elections will cripple the main opposition party. 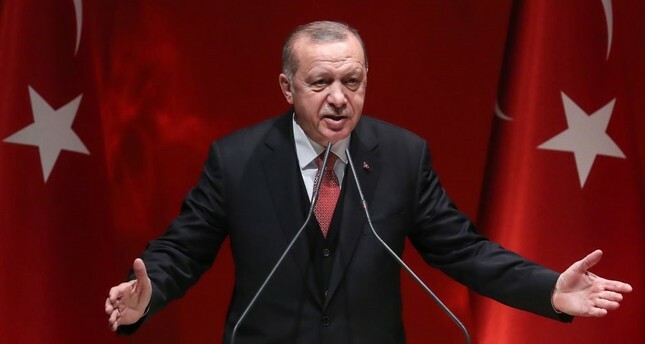 "I believe that the Republican People's Party (CHP) will be gradually marginalized and will abandon the political equation as we, the [Justice and Development party] AK Party and People's Alliance [with the Nationalist Movement Party (MHP)] strengthen our bond with our nation," Erdoğan said at a meeting of provincial election officials in the capital Ankara. Erdoğan made it clear that the upcoming local elections will be a milestone to mark the end of the CHP. In the upcoming polls, the AK Party and MHP have agreed to support each other's candidates in some districts and provinces, while the CHP and the Good Party (İP) had a similar arrangement. "Now, they formed an alliance against our People's Alliance with their supporters. However, they will not succeed. I believe that my citizens will give the necessary response at the ballot box on March 31," Erdoğan said. Thirteen political parties will compete in Turkey's local elections. Turkish local polls are held every five years to elect 1,398 municipality mayors across the country. Among them are 30 municipalities in 81 provinces and 921 district municipalities. Voters will also elect municipal council members in cities. Underlining that the biggest responsibility lies with party members who are responsible for the issues related to the election in the upcoming period, Erdoğan said that they will respect all the outcomes of the elections regardless of who wins or loses. "If there is a problem, we should acknowledge that it is because of us, not because of the ballot boxes [election results]," he expressed. "According to our understanding, one would not obstinate with the people but instead, obeys to it," he said, adding that if they lose in elections, they have to question their emotional bond with the people. "However," he highlighted, "it would be more accurate if we would do this questioning right now and fix our problems before going to ballots."